Buena Park’s new $14 million fire station houses Orange County Fire Authority crews and Division administrative offices as well as City Fire Prevention staff. Planning for the station began with a comprehensive needs analysis to determine the appropriate facility size and features to adequately provide services to meet future service area projections. The City selected a pre-engineered metal building framework that provided significant schedule and cost savings. The 18,000-square-foot facility is framed with recycled steel, fabricated off-site to exact specifications, and includes other economical and environmentally-conscious features. Built to essential service facility standards, the station was delivered under budget in just 13 months. Plans for the new station were already underway when a fire broke in the apparatus bay of the previous Station No. 61 in the early morning hours of January 12, 2017. Some crew members were responding to a call when the fire erupted; fortunately, remaining crews escaped safely. The 50-year old station and four vehicles, including its 100-foot ladder engine, were a total loss. The need for the new station became even more immediate. Planned for evolving higher-density development growth, the station includes administrative offices and training rooms and expanded dormitory quarters/living spaces to accommodate future crews. It is built to serve as a backup EOC with an emergency generator and dual-fuel filling station. The three apparatus bays feature quick opening, bi-fold doors and signal interrupters, which enable crews to reduce emergency response times. Sustainable design decisions were implemented early in the planning process to take advantage of environmentally-conscious and economical options such as the recycled steel approach provided by the pre-engineered metal building (PEMB) framework. This building technique resulted in significant savings over traditional wood-framed stations, offers a longer lifespan, and, fortunately, allowed for expedited delivery. Designs ensured that windows provide for natural light in the office and living areas. Pervious pavement was used in the yard’s parking areas, while drought-tolerant landscaping fills surrounding beds. The engine-wash area features an automatic Fox drain assembly ensuring runoff drains into the sewer systems during use rather than storm drains. Through several cooperative partnerships, the project was expedited; and just 13 months after groundbreaking and 18 months following the fire, crews moved into their new home, delivered under budget. Station No. 61 was delivered through a series of collaborations. The station’s new site was acquired in a land swap with adjacent neighbor, Knott’s Berry Farm. 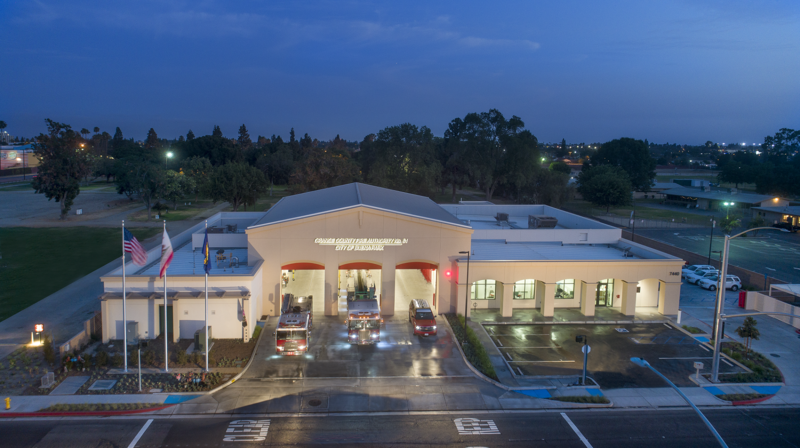 And, while the City owns and funded the station’s construction, planning included active input from Orange County Fire Authority, ensuring designs met its operational needs. Design and construction teams as well as the City’s Community Development; Public Works Department; Building, Planning and Risk Management Divisions; and eight County permitting agencies worked together to expedite permitting, construction and approvals of the new station. Through yet another collaboration, crews were housed in a closed Centralia Elementary School District school next to the new site, ensuring they remained in the service area and making the final transition to the new station significantly easier. This $14 million station houses Orange County Fire Authority crews and Division offices and City Fire Prevention staff. Planning began with extensive needs analyses to determine the appropriate size and features to serve future population and development projections. A pre-engineered metal building framework fabricated offsite from recycled steel resulted in significant schedule and cost savings. The 18,000-square-foot facility includes other economical and environmentally-conscious features. Plans for the new Buena Park station were already underway when a fire broke out in the apparatus bay of the previous Station No. 61 in the early morning hours of January 11, 2017. Some crew members were responding to a call when the fire erupted; fortunately, remaining crews escaped safely. The 50-year old station and four vehicles, including its 100-foot ladder engine, were a total loss. The need for the new station became even more immediate. Planned for evolving higher-density development growth, the new station includes administrative offices, training rooms, and expanded dormitory quarters and living spaces to accommodate future crews. It is built to serve as a backup EOC with an emergency generator and dual-fuel filling station. The three apparatus bays feature quick opening, bi-fold doors and signal interrupters, which enable crews to reduce emergency response times. Designs ensured that windows provide natural light in the office and living areas. Pervious pavement was used in the yard’s parking areas, while drought-tolerant landscaping fills surrounding beds. The engine-wash area features an automatic Fox drain assembly ensuring runoff drains into the sewer systems during use rather than storm drains. The essential cooperative partnerships allowed for the project to be expedited; and just 13 months after groundbreaking and 18 months following the fire, crews moved into their new home, delivered under budget.